Built with just two building blocks (frame and shelf), can be used to build complex rows of racks for all applications in small parts storage (e.g. spare parts storeroom in industry and small trades, sales store in production-linked trade). Simply boltless clip shelving systems can be set up quickly without tools. They can be extended or converted at any time to meet the requirements, and can therefore adapt optimally to the stored goods. Whether it is in the form of small rows of shelves or multi-tier shelving systems, MetaClip provides the optimal solution for any size of warehouse or storeroom. 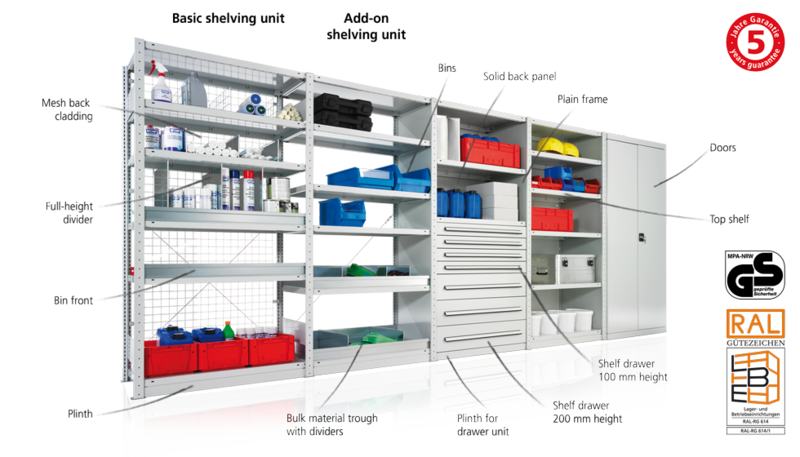 The workshop, storeroom or warehouse can also be fitted out optimally with other components such as shelving and cabinet modules. All Simply clip shelving comes with a 5 year quality guarantee. Easily and quickly assembled, no tools are needed. No nuts & bolts, simply slots together in minutes.